After twenty+ years in business (and forty+ years in life), I decided to share my experience and thoughts in a book, entitled “Labyrinth: The Art of Decision-Making” (“Labirynt. Sztuka podejmowania decyzji”), that was published in December 2014 and quickly became Harvard Business Review Poland’s all-time bestselling title. Since March 4, 2015, it has been available in the best bookstores across Poland and in May 2015, it won the “Golden Owl’ award during the International Book Fair in Warsaw. It was recognized by the Polish Business Trainer’s Association as well, both by the jury of the contest as well as by the readers. I will be happy to sign my book for you. Please contact me. If you are interested, you can order the book on Amazon. Decision-making is often complex and somewhat overwhelming at inflection points, and thereby in ambiguous times. Pawel Motyl offers refreshing and practical insights on the journey of leadership for decision-making. This is a fascinating read! This book is a must-read for any leader wanting to improve how decisions are made. Pawel Motyl demystifies the challenge of decision-making in a dramatically changing world. Using extensive case studies, he points out common decision mistakes and offers specific recommendations. His work is extremely well grounded, researched, and presented. unprecedented, and to wean us from slavish devotion to authority and the status quo so that we can make the innovative, process-driven decisions necessary to be trailblazers rather than bridge-burners. Leadership and life are about making great choices based on sound decision-making. If there’s one decision you need to make about must-read books for this year, make this one your first choice! With a backdrop of history, Pawel shares ‘watch outs’ and ‘ways’ to make better decisions that are practical and executable. Fantastic, gripping read! Brilliantly helping to understand how decisions are made, both one’s own and those of others. Highly recommended! What an amazing book! Pawel Motyl takes his readers on a fascinating journey through perfectly researched case studies. Each page in the book is both inspirational and practical. It is essential reading, not only for business leaders. Perfecting the skill of decision-making is essential in a complex, attention-restricted economy. Pawel Motyl gives you the tools you need to move your agenda forward. Some decisions are easy to make. You’ve already got those covered. But others, leadership decisions, are much trickier. Motyl’s substantial book draws on data, storytelling, and leadership principles to share the rules that will help you learn how to make smarter decisions. And smarter decisions mean more successful outcomes. In an age of unprecedented complexity, uncertainty, and change, the big, important decisions become extremely difficult. Few leaders are equipped with the level of courage and insight that is necessary to make these tough decisions with velocity. Pawel’s book provides rules, principles, and vivid examples that actually help leaders make sense of what they are facing so they can make better decisions to drive better outcomes. PhD, director, leadership and coaching, Google, Inc.
Pawel Motyl took a massive undertaking in analyzing the most complex cases in history where effective decision-making was critical to creating or destroying value for the endeavor at hand. In this groundbreaking book, he offers practical frameworks that will help you prepare for the uncertain future and make better calls at any high-stakes juncture. There is real wisdom in this book. You will remember its lessons and its stories long after you are finished reading it. The world would be safer and happier if our leaders made better decisions—and Pawel Motyl shows us how. In today’s uncertain and complex world, we face new assumptions and unprecedented challenges. Through insights backed by numerous case studies, Pawel Motyl presents us with new rules foreffective decision-making and launching into leadership success. A thought-provoking read! 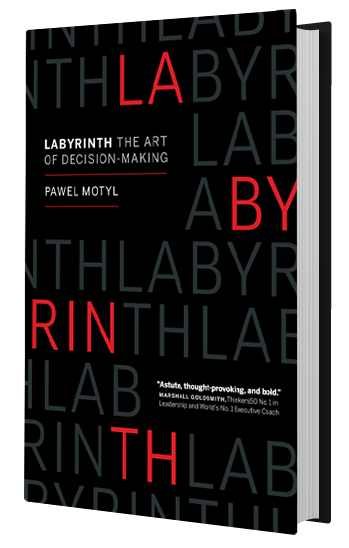 The speed and quality of decision-making is vital in any organization—and Pawel Motyl deeply gets it. In this enlightening book, Pawel has taken real case studies and offered precise and actionable insights to help leaders make more effective decisions. I highly recommend any executive to read and apply the lessons from this powerful book. If you’ve ever wondered how catastrophic mistakes, with lives and fortunes lost irretrievably, could have been avoided, you need to read Labyrinth. Writing about business and leadership with the pace of a thriller, Pawel Motyl will change your assumptions about decision-making, drawing on lessons learned from high-altitude mountaineering to organized crime syndicates.